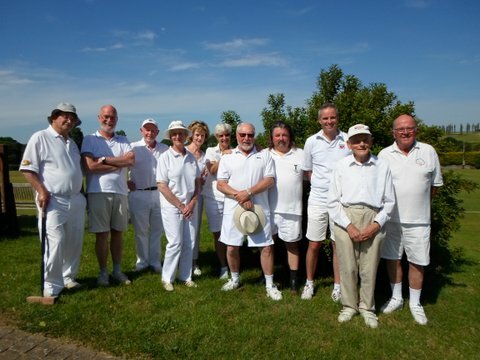 Bath’s Central South GC team made the long trip to the beautiful village of Dowlish Wake in Somerset on Friday, thoroughly enjoying their day out despite losing the match 12-8. The famous sloped lawns added an extra dimension to the game and this proved to be a distinct advantage to the home team with Bath only winning the final round of games, by which time the match was already over. Thacher, sporting his usual array of headwear and footwear throughout the day, was again the mainstay of the team although even he was having to wait until the thirteenth hoop to secure his victories. The Captain also continued to win more games than he lost despite his opponents literally having pocketfuls of extra turns. Richard and Peter found their shooting boots towards the end of the day and even Gordon, threatened with having to walk home if he didn’t score a point, managed to win his final match.